Some people ask, how do you know you’re a writer? Answers vary: when I’ve finished the first draft of my first novel; when I’ve been accepted by an agent; when I’ve been published; when I’ve sold X amount of books; when I’m an answer on Jeopardy! I think the answer is more simple and more complex than that. Nowadays, Pratchett writes via voice recognition software because he can’t type anymore. But he’s still writing. Still telling stories. Still telling people where to go if they don’t like what he does. And I think that’s what makes you a writer: when the world gives you a sh*t hand and you’re still at it. P.G. Wodehouse died with a pen in his hand. Mark Twain, suffering from horrid arthritis in his right hand, learned to write left-handed. Anne Rice’s daughter died and she created Interview with the Vampire – and a young, immortal character named Claudia. Let’s not forget Elle editor Jean-Dominique Bauby who freakin’ blinked his booked The Diving Bell and the Butterfly. I think you know you’re a writer, a real writer, when you’re willing to write through anything: cancer, Alzheimer’s, arthritis, losing your job, divorce, or whatever dark, horrible thing you can think of – and you know that writing will make you feel better. It has nothing to do with publishing or money or fame. Just telling stories lifts some of that burden up and off of you. Sure. Eventually that other stuff might catch up with you…but in the meantime, there’s a bloody book to finish. The lovely folks over at Inefective Ink have loads of prompts that you can pick from. However, for this week’s Saturday pages, I offer you my favorite: The seance was a far greater success than any of us were prepared for. Check out their full list of prompts here. 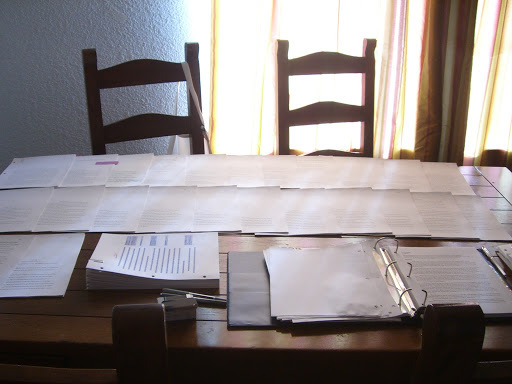 Sometimes, authors use roving POV to create a sense of scale. When you have multiple character POVs, it helps to expand your world. Lots of people in lots of places give the reader a sense of how all the gears fit together and affect each other. Character A sets into motion a chain of events that will trickle through Characters B-D and eventually affect Character E. This can also be a great way to build tension and foreshadow – something George R. R. Martin’s POV shifts do often. Pratchett will use his POV shifts for this sometimes, but often, he’s doing it for comedy. Some of his POV shifts are for the express purpose of creating/maintaining a running gag. One character, Cut Me Own Throat Dibbler, pops up in a lot of Discworld books. He’s never really a key character, but Pratchett cuts to him time and again. He’s going for the chuckle. CMOT Dibbler is a running gag and the POV shift is how he, well, runs the gag. Also, sometimes the abrupt scene change is enough to keep the reader off balance enough that it increases the comedic impact of whatever follows. If you’ve ever watched classic Monty Python, you know what I’m talking about. A couple weekends ago, I attended an event hosted by the Pikes Peak Library District called the Mountain of Authors. It is exactly that: a mountain of traditionally published authors and self published authors all crammed together to listen to panels, talk about writing and publishing trends, and sell books. There must’ve been about thirty authors plus attendees. One of the panels covered the e-publishing revolution now dominating all discussions. It was interesting. Agent Sandra Bond, publisher Mike Daniels, and bestselling author Barbara O’Neal talked about what the publishing world looked like nowadays. But one of the most revealing things was something that O’Neal said was important for all writing: finish a lot of books. In publishing there’s a term called ‘the long tail.’ Basically, it boils down to your backlist making the money for you as an author. Agent Rachelle Gardner has a fantastic post on volume and the long tail here. And she’s got another one talking about why writing a few books before looking for publication is a good idea here. Now, I’ll be honest. I always expected to have to write a few books before anything would be published. I made the assumption that, like short stories and poems, the very first one generally doesn’t get picked up. Practice makes perfect and all that. However, I did not consider the idea of writing of multiple books to be a good thing publishing-wise. Just never occured to me to think about it. And after reading Gardner’s posts, listening to O’Neal talk about buying back her backlist (which is quite extensive), and seeing the piles of books at the Mountain of Authors…I’m convinced that writing a lot of books out of the gate is the way to go. And the majority of Pratchett’s books are about a world floating on the back of a turtle. Who’d’a thunk it? But don’t go thinking that you have to write a series in order to write a lot of books. 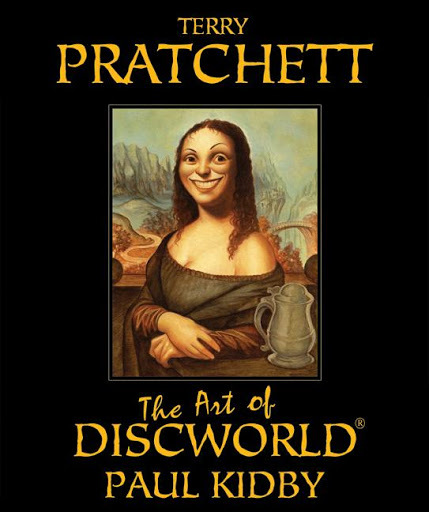 After visiting the Terry Pratchett website and counting up the titles…I count 71 books – Discworld isn’t everything. Sometimes as many as four books came out in a year. That’s a lot of books. He’s still going too, in spite of Alzheimers. There’s a new collaboration with Stephen Baxter called The Long Earth which will be out soon. Does the thought of writing a lot of books intimidate or inspire you? Can you think of any authors who got picked up after writing only one book? How many books do you have in mind for your career? 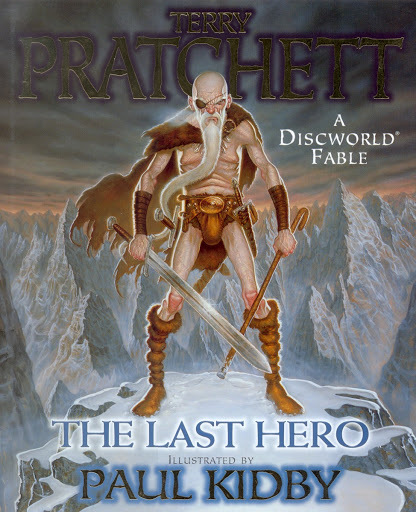 We all know how fantastic Terry Pratchett is, but today I’m going to give some kudos to his illustrators. Over the years, Mr. Pratchett has had a number of different artists do Discworld pieces, and then, he started working with Paul Kidby. How awesome are they? Then, it gets better. You open up the books and inside is fabulous picture after fabulous picture. And, if you weren’t going to any way, you should totally click over to Paul Kidby’s Discworld website. See those posters? I want them. Send me those posters for Christmas. Extra brownie points for anyone who sends me a poster w/Death of Rats. Also, I do have to draw your attention to Where’s My Cow? It’s not a Paul Kidby collaboration, but Grant does a pretty groovy job, too. Now, it’s technically a children’s book, but like many of the fun Pixar flicks, there are a couple of nods to the adults in this one. 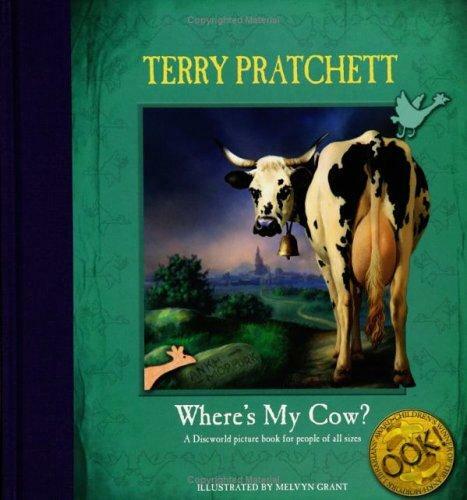 Any Discworld fan will enjoy the inside jokes, and even if you miss the inside jokes, it’s still entertaining. He’s got a more detailed explanation here. But I’ve found that it’s always good to have masterful examples – all the better to illustrate. And who could be better or teach more about the rule of three than Terry Pratchett? His books are riddled with countless examples. In Going Postal, Pratchett opens with a “The Nine-Thousand-Year Prologue.” He describes ships and wreckage floating on rivers beneath the ocean’s surface – which is quite whimsical to begin with. That’s on the second page. Your assignment, should you choose to accept it, is to write your own funny ‘triplet.’ You can have a second or two to set your stage, but after that we’ve gotta be able to see the set up, the continuing line, and then surprise us with your derailment.